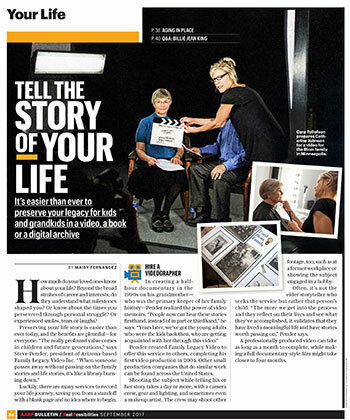 Family Legacy Video® received some great national PR recently, with a feature in the September AARP Bulletin! Learn more about the experience, and read the article, below. AARP shines a spotlight on Family Legacy Video, Inc.
Last April, I received an email from a writer named Maisy Fernandez. She wrote to ask me if I’d be willing to be interviewed by her for an article in an upcoming AARP Bulletin that would focus on ways individuals and families could preserve their life stories. I was happy to oblige, of course, and the next day I spent some time on the phone with Maisy. Flash forward to late June. My phone rang. On the other end was the Bulletin’s photo editor. Turns out the story was slated for September, and he was calling to find out if he could send a photographer to one of Family Legacy Video’s upcoming video biography shoots. Luckily, we had a two-day shoot scheduled for Minneapolis, Minnesota in early July. The timing was perfect, and he booked a local husband-wife photography team to document the shoot. Legacy video shoots are always fun and exciting, but the addition of the photographers took this shoot, held in a Minneapolis video studio, up a notch. The event involved multiple family storytellers, relating their memories of family and of the farm their Norwegian immigrant ancestors homesteaded in Minnesota in the late 1800s. Every storyteller felt like a star. After makeup, each had a portrait snapped, and then the photographers captured images of the interviews from all angles. It was great fun – and we recorded some terrific stories. Then, in mid-September, I found the Bulletin in my mailbox. Not too long after that, web traffic to the Family Legacy Video® website increased, as did phone calls and emails from prospective clients. I’m certainly grateful to AARP for the publicity and for helping to get out the word about the importance of preserving, celebrating, and sharing life stories. If you don’t receive the AARP Bulletin, don’t fret! Here’s an excerpt from the story.